Merciful God, I pray with thanks and gratitude for the great spiritual gift of Saint John Paul II’s apostolic life and mission. Through his heavenly intercession, please grant the following petition(s) . . . Here state your request(s). Grant also that I may grow in love for You and proclaim boldly the love of Jesus Christ to all people. Through Christ, Our Lord. Amen. Dear Saint John Paul, you preached: “The future starts today, not tomorrow.” As I start these nine days of prayer with you, I thank you for reminding me that with God’s help, I can begin again, but I need to start now, not at some distant point in the future. Your words are encouraging and inspiring to me. Please be with me as I progress through these nine days of prayer with you. Dear Lord, You are the greatest Healer. You gave Saint John Paul II to the entire world to show us how much You love us. With Your mighty power and through his intercession, we seek healing, not just of our physical body but our emotional, mental, social and spiritual health as well. In keeping with Your greatest commandment, we will love You with all our heart, with all our mind, with all our soul and with all our strength. We will also love our neighbor as we love ourselves. Amen. Conclude with the Our Father, Hail Mary, and Glory Be prayers. Dear Saint John Paul, you preached: “I plead with you, never, ever give up on hope. Never doubt, never tire, and never become discouraged. Be not afraid.” With your help, I will not give up hope. I will be trusting, confident, persistent and unafraid in prayer. God, our Father, grant us the peace we seek when confronted with different obstacles each day. Guide us so we won’t falter in our steps. May peace always reign in our hearts even if there is fear that we might fall flat on our face. We will not be anxious, but will have faith that is unwavering like that of Saint John Paul II. We will do whatever is true, honorable, just, pure, lovely and gracious in Your eyes, so that Your peace may abide in our hearts always. Amen. What more can I say, but thank you for your confidence in me. Help me to have complete faith in God. Stand with me at all times as my intercessor and spiritual guide until I attain the great treasure of Heaven. Dear Jesus, Son of the living God, we rejoice because we believe that through the intercession of Saint John Paul II, our healing is near at hand. We are joyful in our ways and our speech for we know that You will always comfort us as a mother comforts her children. We thank you for the joy You’ve given us when You were born into our world, because You became one of us in all things but sin. You endured tremendous suffering for our sake, so that we will be saved from our sins. Turn our mourning into rejoicing because of Your resurrection from the dead. Amen. Dear Saint John Paul, just like St. Paul the Apostle who described his journey as a race, you tell me that life with Jesus is a wonderful adventure. Life is not a sprint for me, but rather a winding marathon with its curves and its ups and downs. Help me by being with me at all times as I struggle in this race toward the fullness of life in Christ. God the Holy Spirit, grant us wisdom and knowledge as we wait patiently for the healing You promised. May our families be blessed with patience in helping us cope with illness and other problems. During his lifetime, Saint John Paul was a living testimony of how much God loves us through his patience in dealing with every religious or political leader around the world, as well as with the severe sicknesses that afflicted him. We believe that as long as love reigns in our hearts each day, we will be healed, for “Love is patient and kind.” Amen. Dear Saint John Paul, you preached: “Do not abandon yourselves to despair. We are the Easter people and Hallelujah is our song.” Help me to be joyful in this wonderful adventure of life. Help me always to have true Christian joy in my heart, mind and spirit. Help me always to be faithful to the Will of God in my life. Through God’s loving grace and kindness, we have been blessed with the great kindness shown by the people who take care of us, like our family, friends, relatives, caregivers, physicians, rehabilitation specialists, nutritionists and spiritual advisers. Saint John Paul II manifested incredible love, kindness and forgiveness to the man who tried to assassinate him. We believe that we will be healed if we forgive those who have wronged us, and if we extend a helping hand to our least sisters and brothers living in distress, poverty and need. Amen. Dear Saint John Paul, you preached: “Love your families. Teach them the dignity of life. Teach them the ways of harmony and peace. Teach them the value of faith and prayer and goodness! Help transform the world around you by giving the best of yourselves in the service of others and your country.” Just as Christ taught us, you preached and live the Golden Rule: “Do unto others as you would have them do to you.” How simple it is to hear this, but how incredibly difficult, at times, to do this. Be with me, and help me see God in my neighbor and in all those I find difficult to love or accept. Dear Lord, throughout my lifetime, I have been taught to be a good person and to be a blessing to others. To be good is not just to follow the rules, but more so, to follow You and obey Your commandments. May I bring harmony and peace to others, and spread Your good news to my family, my friends, my community and my country. Saint John Paul II made Your goodness known throughout the world by welcoming and embracing everyone who sought Your presence, regardless of age, gender or creed. Through Your goodness and mercy, we will receive the healing we seek through the intercession of Saint John Paul II. Amen. Help me, dear Saint John Paul, to remember that life with God is the highest and greatest of all goals. In every moment of my life, help me to be focused on my relationship with Christ, so that when my earthly journey ends, my eternal life with Jesus will begin. God the Father, in humility we offer our lives to You in the service of others. May we be like Saint John Paul II in proclaiming our faith and trust in You, so we will be blessed and can fulfill our Christian vocation. It is through our weakness and illness that You have touched our lives, and we now seek Your goodness and mercy to be healed. Amen. Once again, in simple words, you teach us that nothing is more important than life with Christ. Lord, Jesus Christ, grant me the gift of a humble heart so that I can respond to Your call to take up the Cross and follow You each day as Your disciple. I will strive to preserve the unity in my household through my actions of peace and understanding. Through the intercession of Saint John Paul II, please grant me the gift of healing that I earnestly implore. Amen. Dear Saint John Paul, the surest, straightest road to Christ is through His Holy Mother. When I am lost and confused in life, lead me to place myself before Our Blessed Mother, asking her to rescue me to faithfully live the spiritual path that leads to her Divine Son. Teach me to have in my heart the same great love you had for our Blessed Mother. Dear Lord, You are the Greatest Healer. Everything I have comes from You: my life, my health, my family, my friends, my possessions and all that truly matters. I surrender them all to You as I search for meaning and purpose in all that is happening to me. I claim complete healing of my mind, body, heart and soul. I claim healing for those who are suffering and are lost. I claim healing for my family. I claim financial blessings so I can be a blessing to others. Grant me the patience to confidently accept Your answer to my prayers, whether it be yes, no or wait. All I ask I place before You in Jesus’ name. Amen. God, the Holy Spirit, help us to be models of good deeds in every respect by being temperate, dignified, self-controlled and sound in faith, love and charity. May we control our temper and hold our tongue, especially when we grow impatient and are in pain. 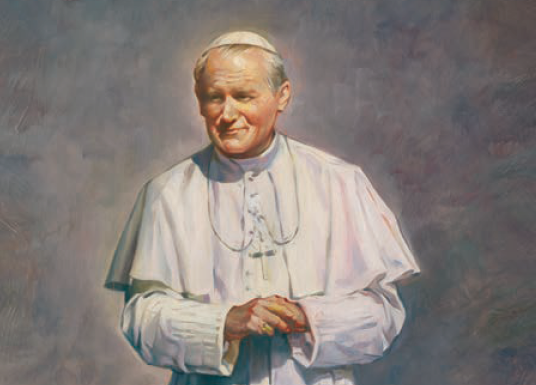 May we be like Saint John Paul II who was an outstanding model of self-control, dignity and unwavering faith. Amen. How can we pray for you? Use the form below to send us your intentions.